You thought you’d done everything right in starting your law firm. Read the blogs and the books, talked to a couple of solos around town, wrote a business or marketing plan, bought the business cards and set up a decent website, sent the announcements out to everyone and their brother too. Yet here it is, three months, six months, nine months later, and things are looking grim. The phone rarely rings and when it does, it’s from some marketing firm trying to sell you the $5000 SEO special. The two potential clients who set up appointments last week never showed up, so you blew $30 on your per diem rental for nothing. Though things are slow, you worked til 2 am two days ago, correcting the motion that was returned because it didn’t comply with the court rules and forking out another $50 to refile it. When you finally muster up the nerve to contact a couple of colleagues to let them know that you’re desperately salivating available for referrals, they don’t return your calls or your follow up email. At this point, the only thing that’s keeping you going is the $1500 in fees that you recovered as part of a nuisance value settlement in a slip and fall case, and the $300 that your uncle paid you to draft his will. Yet all around you, seems that your colleagues are thriving – flying out to depositions across the country and wondering how to bill the time on the plane, or finishing review of a 300 page contract. Meanwhile, most of the other people you approach and try to chat up simply brush by in search of someone more important. Lately, attending these networking functions has gotten so demoralizing that you make excuses not to go. It’s counterproductive, yes, but at this point, there are more days than not when you simply don’t want to leave the house. Of course the Internet isn’t any salvation either. Twitter and the blawgosphere are nauseatingly happy, with everyone either sharing stories about the clients that love them or the magic secrets that helped them earn millions working a few hours a week or annoyingly touting all the wonders of starting a law firm (mea culpa). And suddenly, in a world where there’s never been more opportunity for connection, you’ve never, ever felt like this much of a loser, or this isolated or alone. Because no one told you that solo practice was going to be like this. Don’t hole yourself off: It’s the hardest thing to keep pounding the pavement, networking with other lawyers week after week when you’ve been turned away so many times before. And while it’s so easy to never leave the house (particularly if you work from home), you need to force yourself out and meet people in person. At the same time, don’t keep hitting up the same old tired bar events, either. Check out small business meetings or lectures or try participating in a charitable function like Habitat for Humanity or a food drive. Even if these aren’t lawyer-only or even business-only events, you may meet other people who can connect you to people who may want to hire you. Take charge: You might also try to organize something yourself. I know; seems scary and maybe too overwhelming when you’re down in the dumps. So just make a list of what needs to be done and tick through it on auto-pilot. Once you start planning an event – a lunch or an office party – you’ll get caught up in the momentum. And once it’s over, you’ll feel great when you start reaping the benefits of return invites and people seeking you out rather than the other way around. Do or change just one thing: Turning around an entire firm might be difficult, but it shouldn’t be hard to pick just one thing to do or change. Maybe you’ll commit to writing an ebook or finding a place to give a presentation. If working from home is just too isolating or distracting, look into coworking spaces space which may not be that expensive but where you have a chance to interact with other people. And if you’ve been limiting your interactions to only social media or email, well…it may be time to pick up the phone or get out and meeet other lawyers. Own Up: Let people know that things aren’t going well and ask for help. Again, it’s the hardest thing in the world to admit that you’re struggling or to ask for help, but it’s the only path forward. On listserves, I’ve seen emails from people asking for help and invariably, six months later, they’re on the upswing. So put out your ask – on a listserve or a close friend. If there’s a blogger whom you’ve built a relationship with, write or pick up the phone and call – (real bloggers are really good about talking to our colleagues and readers). One caveat: don’t put people in an awkward position by begging for work. Recognize the “spin” cycle Realize that at least 70 percent of the people you meet are editing out at least 70 percent of the whole story to give a positive spin. Yes, that colleague of yours may have reviewed a 300 page contract, but that may have been his only piece of paying work for the past six weeks. Or the friend who’s trotting off for what seems like a lavish weekend in New York is really riding the $25 bus and staying free on her college roommate’s floor. People don’t mean to lie — it’s just a natural defense mechanism to conceal ourselves at our most vulnerable. Just be patient: Online, almost everyone seems like an overnight success. 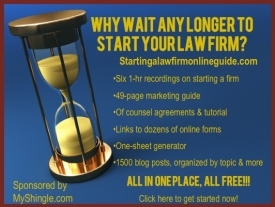 In truth, building a law practice for the long haul takes time. I’ve suggested that three years is a more appropriate guidepost, but really, it could take even longer. So just keep putting one foot in front of another and keep your eye on the prize. Turn the spin cycle on yourself: Though it can be intolerable listening to false positives, every so often, it pays to take a lesson and focus on the bright side yourself. Maybe you only collected $1500, but yes, you did settle a case. Maybe relatives are the only people who want to hire you right now, but at least you can talk about how you drafted a will. And maybe you’re barely scraping by, but at least you can say that you have a law firm. Because you do.